Sonny Stein, shark conservationist and reclusive oddball is seduced by the wife of a wealthy entrepreneur and tricked into giving up his finned friends for scientific research and sideshow entertainment. But when Sonny discovers the ruse, he uses his mystical ability to command his sharks to hunt and kill those responsible. Richard Jaeckel was always an engaging actor to watch over many decades of distinguished film service, and despite his simpleton turn here, there’s still a hint of the professionalism in his thespian skills, that will endear his character and have you rooting for the shark guy. Throughout the movie, Jaeckel’s rather dim alter ego descends into paranoia and eventual insanity, culminating in a frenzied rampage led by his number one Tiger shark who he commands with a telepathic dominion. In flashback we see that his supernatural power is the result of an ill-fated trek in the tributaries of South East Asia, many years earlier, where he survived in shark infested waters, and was bestowed an ancient medallion by a local Shaman. 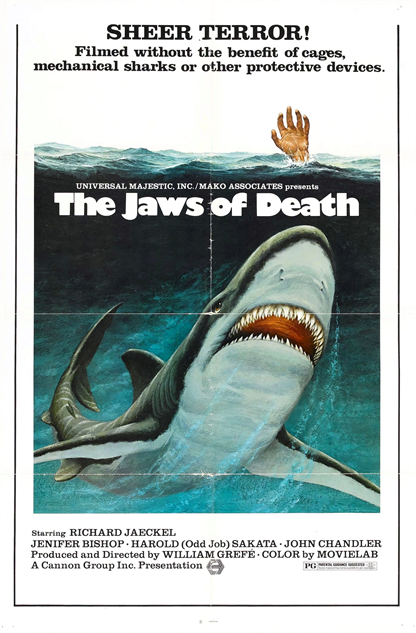 Being low budget, “The Jaws of Death” can’t afford to rely on expensive special effects or the bells and whistles usually associated with shark attack pictures. Stunt men interact with real sharks, offering a raw, realistic view of the relationship between marine life and humans. Despite the daring sequences, it’s an unappealing contrivance in which the two species look anything but comfortable in each other’s presence, and disappointingly, the sharks look decidedly harassed and exploited, which doesn’t convey the mutual respect Sonny is supposed to enjoy with his much maligned ‘friends’.